Let's solve those storage problems. Storage problems can be solved. Do you have storage issues? Are you like me, with just too much stuff? I know I should get rid of some of it, and I really do toss things when the mood strikes, but until the process is completed, good storage is a sanity-saver. Here are some ideas that may help you, too. A closet organizing system is a very good way to get a handle on the mess inside a closet, the cost is not too bad, and it's amazing how much more stuff will fit in an organized closet. If you can't invest in a whole system, try a few simple changes. You can double your closet hanging space by adding a second rod at 40" from the floor and adjusting the upper rod to 80". Add over-the-door racks to regular doors and use the space for shoe storage, cap racks, valets, and general purpose hooks for purses, belts and such. Hanging shoe bags with multiple pockets are great for storing small toys, toiletries, folded scarfs, rolled belts, and more. Speciality hangers for multiple skirts and pants, and linking hangers give you additional hanging space without taking up more rod room. Stacks and Stacks has some great solutions to storage problems. 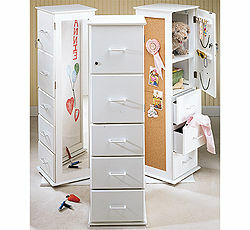 For another take on closet organizers, take a look at this page. What about all that space under the bed? Under-bed storage containers are widely available, but have you also considered bed risers to create additional space? These come in heights from 6" to 15", are very easy to install, and make the bed a real focal point, in addition to allowing you to store bigger containers underneath. If you need to allow space for a television, you might consider a wall-mounted TV rack. This will free up floor or dresser/desk top space, and swivel stands allow you to adjust the angle of the TV. I know some people argue that a television doesn't belong in the bedroom, but I'm not one of them. If you have a television, you probably need to think about storage room for CDs and videotapes, so check Stacks and Stacks. They even have units specially made to store those odd-sized Disney videotapes. 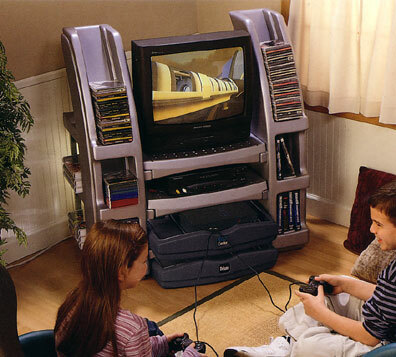 If you have Disney videos, chances are you have a game station to deal with. Did you know they make game station organizers to help declutter the video game mess? And along the same lines, if you put in toy organizers, you have at least a chance that the toys might get put away. I even found a junior-sized home locker at YourKidsDirect with a full-length mirror, a dry/erase board and a cork board, and it swivels! How cool is that? Substitute a trunk or stacking trunks for a bedside table and you instantly gain extra storage room. Same thing with a foot stool or bench- swap it for one of the great storage ottomans available and enjoy the extra space. Some rooms have decent-sized floor space, but the closets are a joke. 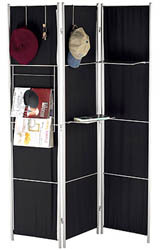 In this case, you could add a rolling garment rack and screen it from view with a room divider. Get a divider with shelves and you also add extra hanging space and display room for special accessories. For an interesting viewpoint on clutter and how it affects us, take a look at the side effects of clutter. The bottom line is that storage is an issue that you must consider, unless you are willing to sort through and toss out everything you don't have room for. And if you are, please email me and let me know how you did it. I can use the help.